This blog post was originally drafted on November 16, but couldn’t be posted until now because the Antarctic fieldwork site lacked an internet connection. Our team is studying how rocks alter and erode in one of the most extreme environments on the planet—Antarctica. 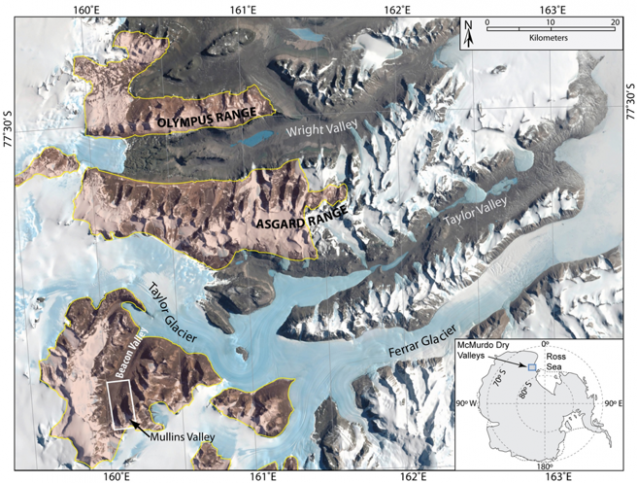 The project is called Landscape evolution in the McMurdo Dry Valleys: Erosion rates and real-time monitoring of rock breakdown in a hyperarid, subzero environment, and it is funded by the National Science Foundation (NSF) Office of Polar Programs. Our team is made up of four scientists. I’m the primary investigator (PI) and a postdoctoral research scientist at Columbia’s Lamont-Doherty Earth Observatory. Co-PI Joerg Schaefer is a Lamont Research Professor and adjunct professor at Columbia University; co-PI Martha-Cary (Missy) Eppes is an associate professor at the University of North Carolina-Charlotte; and collaborator/consultant Kate Swanger is an associate professor at the University of Massachusetts-Lowell. Joerg won’t be heading to Antarctica with us this year, which leaves us with a three-person, all-female field team. This will be my fifth Antarctic field season, Kate’s eighth, and Missy’s first deployment. This project represents several firsts for me: the first NSF proposal I’ve been awarded as a PI, my first time leading an Antarctic expedition, and my first time deploying acoustic emission sensors (more about this later) in Antarctica. It has been a tremendous learning experience in managing a project and planning the logistics of a long Antarctic field season. We’ve had our work cut out for us since last summer—between a late funding decision due to the federal government shutdowns of early 2018, and a multi-month delay in the production of our equipment, we had to scramble in September to test and pack the scientific gear in time for the Antarctic cargo shipping deadline. Luckily it came together for us in the end, and we’re (hopefully!) on our way to a successful field season. At its core, this project is an investigation into the surface processes active in ice-free areas of Antarctica. Specifically, we’re interested in weathering and erosion. These two terms are often used interchangeably, but they are in fact referring to two distinct processes: weathering is rock breakdown that happens in place (“in situ”) by either chemical or mechanical means, while erosion removes and transports weathered rock material to a new location. Together, weathering and erosion act to dramatically alter the surface of the Earth, from the action of rivers and glaciers carving large swaths of bedrock, to microorganisms that inhabit and slowly weaken the fabric of individual boulders. The subzero temperatures and katabatic winds from the Polar Plateau can turn even a simple task, like writing in one’s field notebook, into a numbing ordeal. You may ask why we are going all the way to Antarctica to study these processes. The answer is that Antarctica is a unique terrestrial environment: most of the continent is a desert; more specifically, a cold, polar desert. Although Antarctica is covered by a vast amount of ice, it is extremely arid with very little liquid water at the surface. 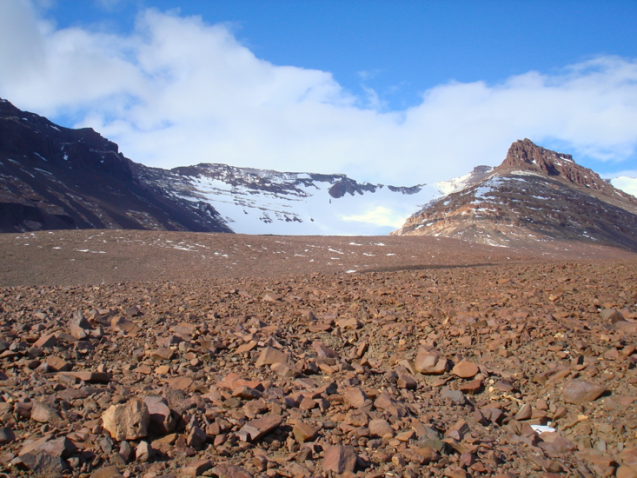 Our study location is in the McMurdo Dry Valleys (MDV), which is the largest ice-free area on the continent. The MDV is often referred to as the coldest, driest, and windiest place on the planet, and thus represents a climatic extreme where we find natural processes not observed anywhere else on Earth. In fact, the environment is so extreme that it is often used as an analogue for conditions on the surface of Mars. We’re interested in discovering (1) the processes responsible for weathering and erosion in the MDV and (2) the rates at which they occur, and whether these rates have changed over time. I’ll discuss the techniques we’ll be using in the next post. Our main field site is Beacon Valley, located in the western-most part of the MDV. Its high elevation and inland distance from the Ross Sea coast make this location one of the coldest and driest in the already cold and dry MDV. Mullins Glacier, a debris-covered glacier, flows from Mullins Valley into Beacon Valley and is covered with dolerite (and to a lesser extent sandstone) boulders and sediment. It is on this glacier that we’ll be focusing our investigation and setting up a camp. The amount of time that the boulders have spent on the surface of Mullins Glacier range from almost none at the headwall in Mullins Valley to possibly more than a million years near the end of the glacier in the middle of Beacon Valley. Unfortunately, from working here in previous field seasons, Kate and I both know that the same reasons that make this a good location to study extreme surface processes can also make it a fairly miserable place to conduct fieldwork: the boulder-y terrain is challenging and (at times) dangerous to navigate, and the subzero temperatures and katabatic winds from the Polar Plateau can turn even a simple task, like writing in one’s field notebook, into a numbing ordeal. We have our work cut out for us! The field team will leave the US on November 19, 2018, traveling through Christchurch, New Zealand, eventually making our way to McMurdo Station on Ross Island, Antarctica. 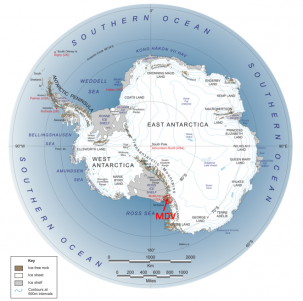 We plan to spend approximately one week in McMurdo, then most of December camping in Beacon Valley. Kate and Missy will leave Antarctica after the camp-based portion of the season, and I will stay in McMurdo until February. During this period, I’ll coordinate weekly trips back to the site to perform maintenance and download data from the deployed equipment.